Truss baffles are essential for any range design requiring clear spans of 50’ or more. 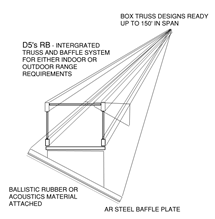 The RB has been a vision of D5 after countless requests from range owners for us to solve their long span truss needs, all while incorporating the steel baffle plates. Our system design can either rest on a concrete wall provided by others or on a structural column we can provide at additional cost. We developed our RB Integrated Truss and Baffle System that incorporates the baffle plate attached to the bottom of our truss. The RB ships as an assembly and sets in one piece, saving time and money. It does not require the baffles to be attached in the field, which ends up costing you more. We recommend choosing your steel baffles next.